Wire partitions are used to protect and safeguard your employees and your inventory in a variety of applications, including in warehouses, restaurants and retailers, offices, industrial and manufacturing facilities, and government and military facilities. A few of the different products within this product line are listed below. Woven wire partitions – Panels, sliding doors, and hinged doors are all available components of woven wire partitions should the customer need them. Welded wire partitions – Panels, sliding doors, and hinged doors are all available components of welded wire partitions should the customer need them. Rack Safety Systems attach to the racking in your facility to prevent your inventory from falling off your racking system and potentially becoming damaged or injuring someone. Rack safety systems install to your pre-existing rack with mounting brackets and is, in many cases, easier to install than netting alternatives. Mezzanine handrail safety systems are a safe and inexpensive alternative to traditional handrails. A primary feature of this system is the added safety feature that is not present with traditional handrails. With the addition of woven wire in addition to the handrail, you can prevent costly and dangerous accidents due to objects falling off of mezzanines. Panels, pull out panels, kick plates, top rails, and posts are all either provided standard or made available depending on the customer’s specification. 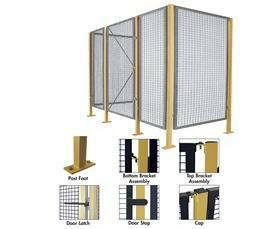 The S. W. Betz Company is a preferred distributor of all types of wire partitions and barriers for SpaceGuard Products. SpaceGuard Products, located in Seymour, Indiana, is a leading manufacturer of wire partitions and area guarding products and has been around since 1990. If you are in need of or would like more information on any of our wire partitions and barriers, please contact us and one of our team members will be happy to assist you. For more information about Wire Partitions & Barriers or any other product or service from S.W. Betz, fill out and submit the form to the right.